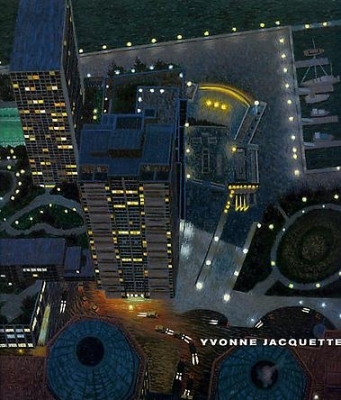 Yvonne Jacquette was born on December 15, 1934 in Pittsburgh, Pennsylvania and grew up in Stamford, Connecticut. She attended the Rhode Island School of Design, Providence from 1952 to 1955, when she moved to New York City. 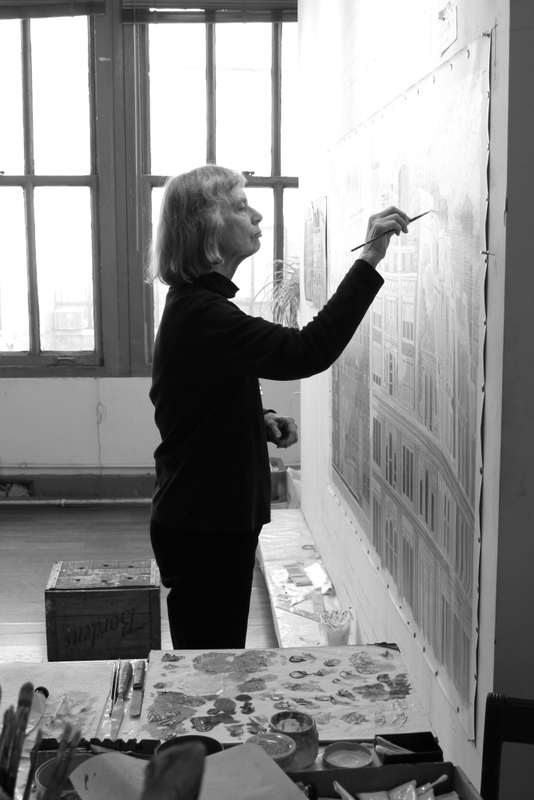 She continues to live and work in New York City, as well as in Searsmont, Maine. A flight to San Diego in 1969 sparked Jacquette’s interest in aerial views, after which she began flying in commercial airliners to study cloud formations and weather patterns. 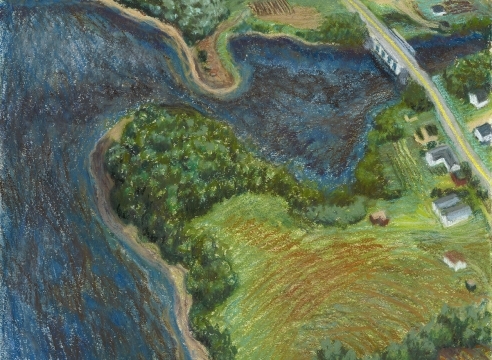 She soon started sketching and painting the landscape as seen from above, beginning a process that has developed into a defining element of her art. 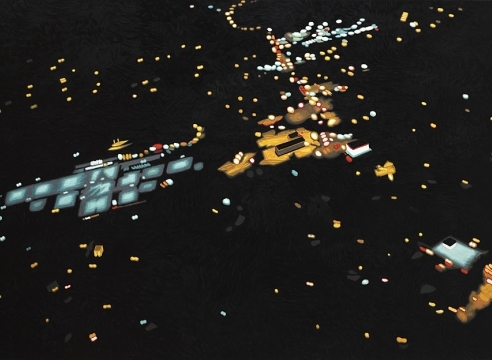 Her first nocturnal painting with an aerial perspective, East River View At Night (1978), inspired an ongoing exploration of the effects of bright lights, reflections, and indistinct objects set against surrounding darkness. 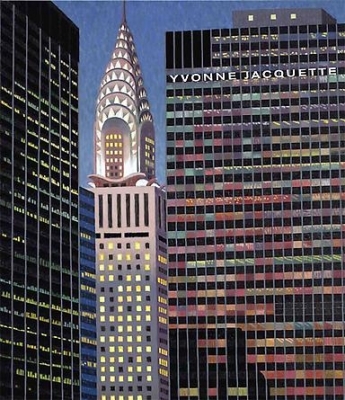 The city of New York is a special focus of Jacquette’s. 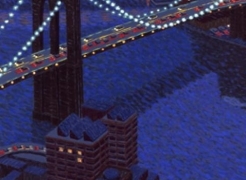 In the 1980s and 1990s, she chartered planes from Teterborough Airport in New Jersey to circle the city while she sketched the scene below. She has also worked from the Empire State Building, and, from 1974 through early 2001, often used empty offices or an enclosed deck at the World Trade Center. 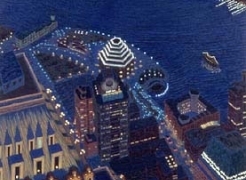 Jacquette has painted aerial landscapes across the country, as well as city views in San Francisco, Chicago, Minneapolis, Philadelphia, Vancouver, Tokyo, and most recently, New Orleans. 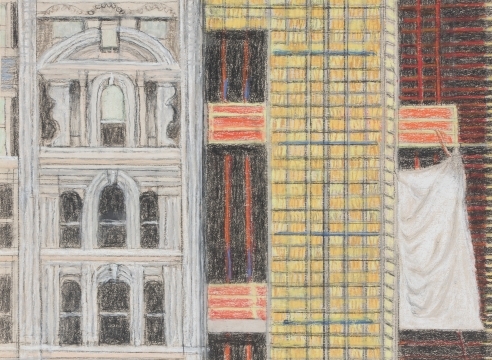 After a trip to Hong Kong in 1990, she began incorporating composite viewpoints into her work, realizing that she could better express the city’s many layers of complexity by creating new spatial configurations through multiple perspectives. 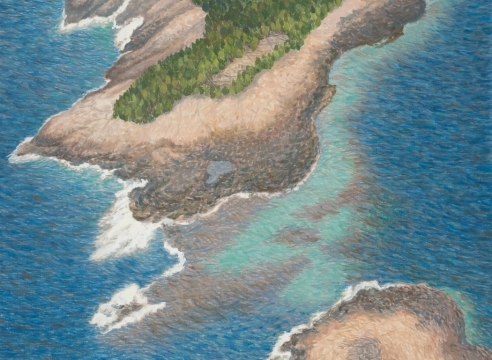 Since then, she has continued to base her paintings on pastels made from direct observation, while frequently enlivening compositions through heightened color, repetition of certain elements, and manipulation of light, scale, and perspective. 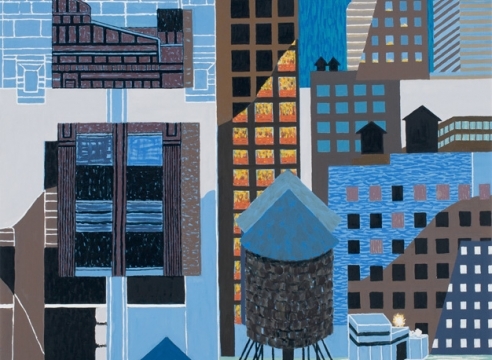 As she approached the rendering of space with greater freedom, her paintings became both more inventive and disjunctive, combining aspects of observation, memory, and imagination. 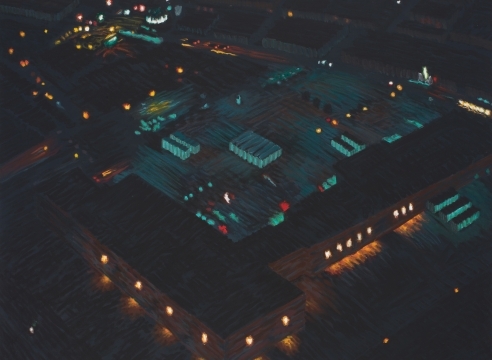 Recently, she has taken photographs of shopping malls and parking lots in rural Maine from a helicopter at night. The resulting pastels and paintings are among her most abstract. 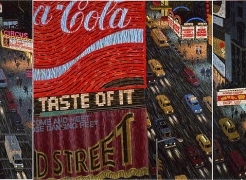 Jacquette participated in her first group show in New York City in 1962 and has been exhibiting steadily since. In 1965 she had a one-person exhibition at Swarthmore College, PA. In 1983, the St. Louis Art Museum organized her first major museum exhibition. 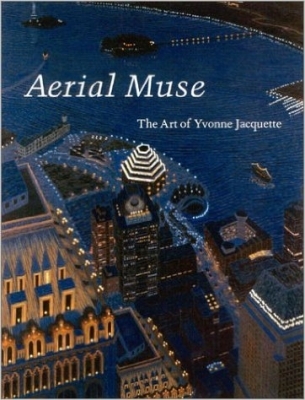 A comprehensive retrospective, Aerial Muse: The Art of Yvonne Jacquette, originated at the Cantor Center for Visual Arts, Stanford University, CA in 2002 and traveled to Colby College Museum of Art, Waterville, ME; Utah Museum of Fine Arts, Salt Lake City; and the Hudson River Museum, Yonkers, NY. 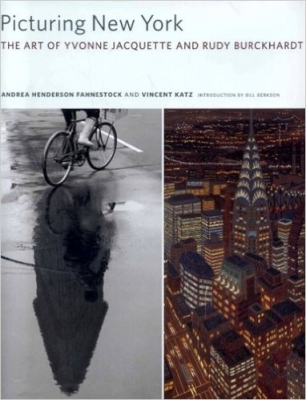 In 2008, the Museum of the City of New York organized Under New York Skies: Nocturnes by Yvonne Jacquette, which was shown concurrently with Street Dance, an exhibition of photography by her late husband, Rudy Burckhardt. 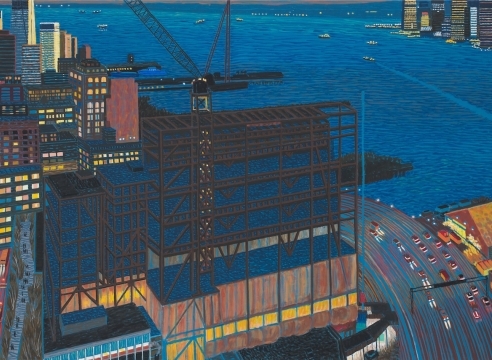 Jacquette’s work is included in the collections of over 40 museums, such as the Brooklyn Museum, NY; Hirshhorn Museum and Sculpture Garden, Washington, DC; The Metropolitan Museum of Art, New York; The Museum of Modern Art, New York; Philadelphia Museum of Art, PA; and Whitney Museum of American Art, New York. Art in America: "Yvonne Jacquette at DC Moore Gallery"
The New Yorker: "Yvonne Jacquette"
Yvonne Jacquette in Conversation with Vincent Katz from DC Moore Gallery on Vimeo. 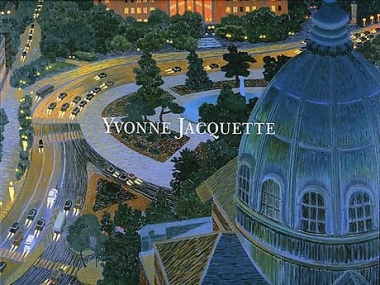 "Yvonne Jacquette: Paintings 1981-2016" at DC Moore Gallery.